As Giants Go to Peaceful Pastures. I wrote that for the graduating class of the U.S. Army Infantry School, Fort Benning, Georgia, Cycle C-6-1 in 1982. I was the honor graduate of my first military school, a combined course of instruction for new soldiers called “OSUT” or “One Station Unit Training”. It was an efficient factory that turned out good soldiers. We were supposed to stem the tide of the red menace we feared would blow through the Iron Curtain like a steel hurricane and storm across Europe to push liberty and democracy into the Atlantic under the crushing torrent of Communism. We were ready to fight. We just never knew what war we would be fighting. “A war with no battles, no monuments… only casualties” as Tom Clancy wrote in The Hunt for Red October. This week two incredible monuments of this Cold War were consigned to museums and displays. And their internment is symbolic of the end of this terrible era. The last flying Avro Vulcan, XH558, at an airshow appearance earlier this year. The only flyable Avro Vulcan Bomber, aircraft number XH558 made her final flight this week. The four jet engines that power the massive, bat-like bomber have been declared too old to fly safely so she returns to the surly bonds of earth as a relic. The day before the only surviving North American XB-70 Valkyrie was wheeled to a new and permanent indoor display facility at the National Museum of the United States Air Force in Dayton, Ohio near Wright-Patterson Air Force Base. 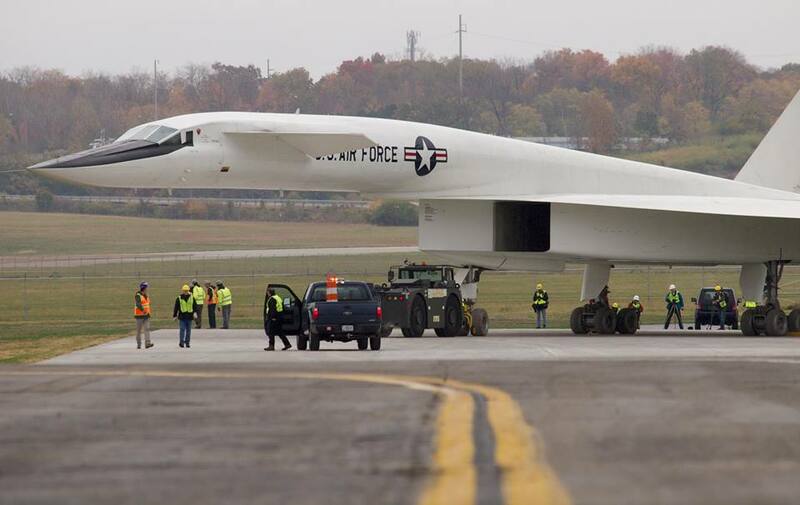 The only remaining North American XB-70 Valkyrie being towed to its final exhibition building at the National Museum of the Air Force in Dayton, Ohio. These two giant bombers were designed to deliver nuclear mega-death in an atomic slugfest that thankfully never came. Some strategists who espouse the deterrent theory suggest that it is because these bombers flew that the Cold War never got hot. The two aircraft are quite different. The Avro Vulcan was an operational jet bomber used by Britain’s Royal Air Force. She wore a huge cloak of camouflage and the red/blue roundels of The Empire. The Vulcan saw combat in the 1982 Falklands war when she launched long-range bombing raids on Argentinean positions in Port Stanley in support of a British invasion. Vulcans flew a complex 3,914-mile transit one-way to their targets after leaving an airbase on Ascension Island. They relied on a relay system of aerial tankers to refuel them. The Vulcan was also a star of the 1965 James Bond film Thunderball in which a nuclear-armed Vulcan is hijacked to the Caribbean and its atomic bombs ransomed by an evil network. The Rockwell XB-70 Valkyrie’s lineage is less illustrious but no less sensational. The XB-70 was a massive, six-engine supersonic jet bomber intended to penetrate Soviet airspace over the arctic at three times the speed of sound. Then it would level Russian cities with nuclear megadeath. The Valkyrie wasn’t a total disaster, but very close to it. One of the two prototypes crashed in an ill-fated publicity photo shoot in the California desert, killing two test pilots. The single remaining Valkyrie was subsequently grounded. The program cancelled. It became an elephant as white as its gleaming, heat resistant paint. An impossible fist of an airplane for a conflict decided in whispers. And so the big cold war bombers are consigned to the ground. To the museums. Their stories will be told and retold. They will be cleaned and preserved and shined and photographed. Boy Scouts and school children and old men will visit them. While the internment of these two massive Cold War relics signals the passage of a dangerous era it is an irony that a new mega-bomber project, the “LRS-B” or Long Range Strike Bomber was awarded to Northrup Grumman this same week. On Wednesday Defense Secretary Ash Carter and the U.S. Air Force announced that Northrop Grumman won the development contract over competitors Boeing and Lockheed Martin. The program is expected to generate $55 billion in revenue for Northrup Grumman over its life making it one of the largest defense acquisition programs in history. 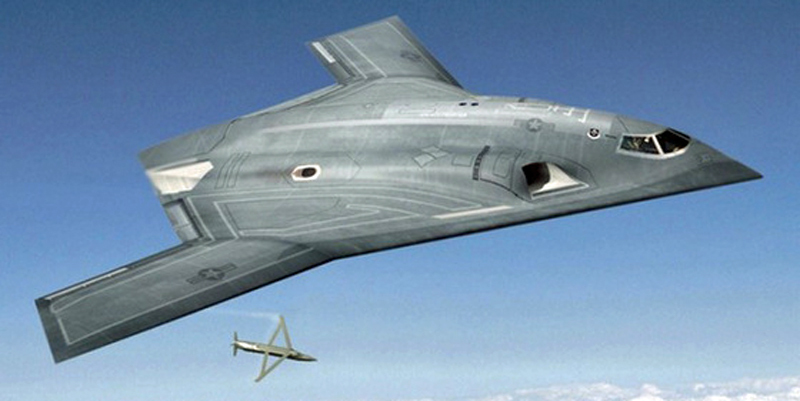 Artist’s concept of the LRS-B bomber project awarded this week to Northrup Grumman. Some believe the next secret stealth bomber has already been seen, and photographed, over the American southwest when photographers got long range photos of a mysterious flying triangle. One member of the mega-bomber club absent from the party due to work obligations is the venerable Boeing B-52. The B-52 still flies operationally. It is 52 years old this year. The aircraft is much older than the crews who fly it, and there is no end in sight for the giant, eight-engine “BUFF”. In fact one B-52 stored at the Aviation Maintenance and Restoration Group facility at Davis-Monthan Air Force Base in Tucson, Arizona for eight years was actually returned to service after being refurbished. While the consignment of the Vulcan and the XB-70 to static displays signify the end of the Cold War they don’t signal the end of conflict I hoped for back at Fort Benning. The conflict between ideologies continues, in some ways more like ancient war than modern conflict. While it is solemn and peaceful to say goodbye to these graceful leviathans it is also worth reflecting on the fact that their replacements have likely long been in the air, veiled in secrecy and flying from remote desert runways. For, as the often misattributed but entirely accurate quote goes, and contrary to my flowery and hopeful speech as a young soldier, “Only the dead have seen the end of war”.